I'm an old school Spider-Man fan. I grew up with a particular image of he famous wall crawler in my head that was defined early on and I still sort of gravitate back to that version of Spider-Man more often than not. Things just weren't the same after The Clone Saga for me and I never really managed to get back into the comic ever since then. But from time to time I make quick explorations into limited mini-series or one-shot stories just to see what things are like. And this is why I ended up getting the comiXology version of Spider-Man: Blue one day since it went up on sale for a limited period of time. I wasn't quite sure what to expect from this story, but I was rather curious that Gwen Stacy was front and center on the cover. Plus there's the fact that the comic was put together by the creative team of Jeph Loeb and Tim Sale. I best remember the pair given their work on Batman: The Long Halloween, which remains one of the few Batman comics that I actually own. I totally respect Batman, but I never really felt the need to buy the comics since my mom was already collecting them. No sense in getting duplicates, right? Synopsis: Spider-Man: Blue is a 6-issue limited comic series than ran from 2002-2003. It was written by Jeph Loeb and illustrated by Tim Sale. The story takes place on a particular Valentine's Day in the modern period, although no specific year is truly given. All we know is that Peter Parker is already married to Mary Jane Watson. 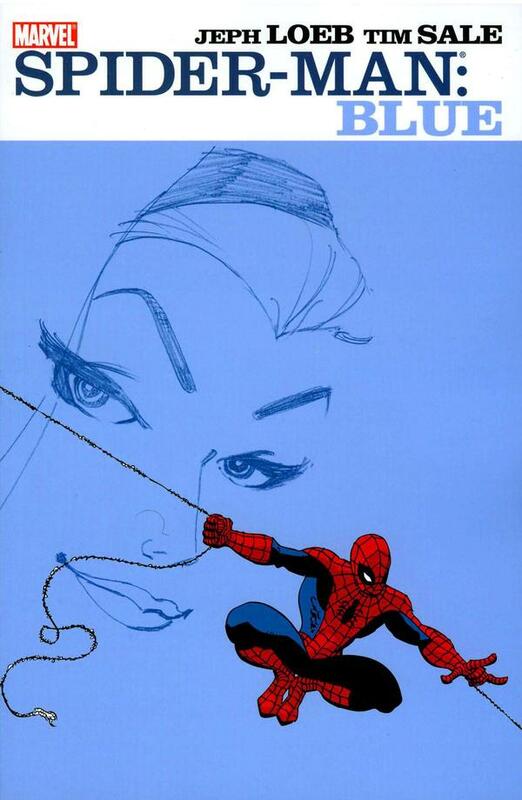 And on this particular day, Peter is feeling rather down (or "blue") as he remembers his first love, Gwen Stacy. Thus he is narrating the story of how he met Gwen into a tape recorder to sort of process his feelings. Thus we get to see the story of how Peter Parker first meets Gwen, how they started to fall in love and how he also had to juggle the attentions of one feisty Mary Jane Watson. Thus the story sort of covers Spider-Man's adventures between Amazing Spider-Man Vol. 1 Issues 43-48 and 63 that touch on a number of key events in Spider-Man history including one of his major confrontations with Norman Osborne as the Green Goblin (but not that confrontation, if you get my drift), along with a series of attacks by different villains including Dr. Octopus, the Vulture and others. The comic presents the possibility that all of these attacks were actually being organized by some unseen figure who was determined to throw more obstacles in his way. First, the art style was nicely complementary to the overall narrative. I never realized that Tim Sale's art style would be so reminiscent of the earlier comics and yet don't exactly feel dated. Comparing his art here to his work on The Long Halloween, he has certainly come a long way and he adapted his style to be a little softer around the edges, which is more fitting to this tale of young love. Loeb really captured the feel of those older comics and managed to update the dialog in a manner that respected the original work but also didn't make things sound too archaic or anything like that. More than the update of tone, he certainly made sure that the characters were true to how we all remember them, which is really the most important part of what is essentially a nostalgia tale for all of us. The comic provides an interesting perspective for some of Spider-Man's earliest adventures and of course his relationship with Gwen. Sure Mary Jane is there, too, but there's no denying that Gwen is the star of the show. And that's not a bad thing at all given how most modern Spider-Man readers may not know about her importance. Spider-Man: Blue is a seemingly simple book, but therein lies its true value. It's beautifully done in a manner that is very honest and real and thus making the characters feel all the more palpable to us readers. And thus I'm glad to rate this book as 5 moments of Mary Jane being brilliantly herself out of a possible 5.